A radical redesign planned for the lobby and exterior of 200 Liberty Street will breathe life into “a lot of dead space, inside and out,” says an executive of the office tower’s owner, Brookfield Properties. “Right now it’s an underutilized and under-amenitized building in general,” Mark Kostic, Brookfield’s vice president for asset management, told Community Board 1’s Battery Park City Committee this month in a presentation on the redesign. Kostic said the lobby will be enlivened with a café and public seating, and brightened by a 40-foot-high glass entrance. More light will come into the lower two floors with the removal of a north- and west-facing mezzanine. But gone, too, will be the lobby’s imposing marble stairs that ascend to the mezzanine and curve dramatically around an escalator from a circular pediment. What now is a majestic dome that rises high over the lobby will be hidden from public view by the addition of a ceiling above the mezzanine, according to the renderings. 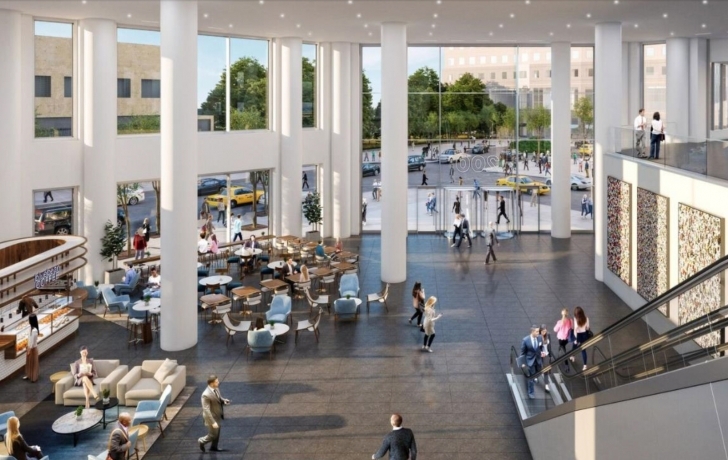 A sizeable portion of the lobby’s public space would be closed off for a 4,000- to 5,000-square-foot restaurant that opens onto West Street and a patio of outdoor seating. Space for a potential retail tenant also will be created in a walled-off part of what now is the West Street side of the lobby. The West Street entrance, which Kostic called underutilized, would be removed. To a comment by a resident that Brookfield is junking up an “architecturally beautiful” lobby, Kostic said modernizing the space was necessary to keep its tenants. The building, previously called 1 World Financial Center and completed in 1986, is 98 percent rented, but a number of the major leases expire in 2020, the New York Post reported. Along with the interior redesign, the entrance would be built outward, as would storefronts that are now recessed behind arcades, or covered walkways, that will be removed. Two Hundred Liberty is the last of Brookfield’s five building to undergo renovations and upgrades to retail and common areas as well as mechanical systems, at a total cost of $300 million, Kostic said. The project, he said, would begin in the first quarter of next year and take 18 months to complete.